There was a button on Atlas 'Data Home' for the entering of Roving Records with an observation date from 1 November 2011. Only records for 10-km squares that are covered by local atlas regions were enterable. For all other casual records BirdTrack was used. You could enter your Timed Tetrad Visit data as usual for tetrads that had been allocated to you. Paper forms were returned to your local atlas organiser for inputting locally. A number of counties conducted local tetrad atlases during the period of the national atlas. These counties had been aiming for 100% coverage of tetrads in most cases. Some local projects have been completed in line with the national atlas and have an end date of 2011 in the table below. About half continued for another year and finished at the end of the breeding season in 2012. Three projects continued into 2013. A special effort was made to submit Roving Records to tetrad level when birdwatching in any of the counties below that continued into 2012 and 2013. 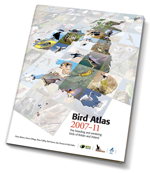 Read more about published county atlases and avifaunas.